Was thinking of getting 'KillTeam' , you have a LOT of painting/gluing there ! Tell me about it! I'll probably spend 2-3 weeks of hobby time just assembling the stuff, let along actually getting some paint on them! That's a lot of building! Good luck with your terminators! Thanks! In addition to all the terrain in these boxes, I also have the Sector Mechanicus Galvanic Magnavent terrain from the Imperial Knights: Renegade box... Which mean I'm going to have kill zones with loads of terrain... When I actually get them all done!? Time to set up a little production line! Great stuff. One of the guys here went all in as well so I'm looking forward to trying out the rules later this week. I'm being a bit cautious before I jump in as I absolutely despise the 40K core rules, but I hear that they've mixed things up a bit to help break-up the brutal IGOUGO mechanic. Cheers! I am pretty excited about it. We had a lot of fun earlier this year with Shadow War: Armageddon. It had it's problems, but it was fun. I'd been thinking about jumping in on Necromunda for a while as I heard it had a completely new (for GW) activation mechanism, but then I heard this was coming out and hoped it would incorporate both the changes that were made in 8th edition 40K (SW:A came out at the end of 7th and was still mostly using 7th rules...) and the activation system in Necromunda. I don't think the new Kill Team is exactly like Necromunda, but it's looking pretty good so far... If it doesn't work out... well... 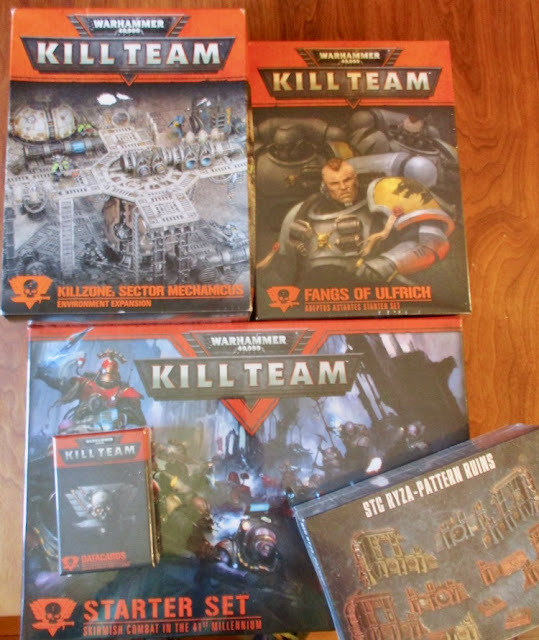 I got a lot of cool terrain and minis to use with Wrath & Glory (which I am also going all in on when it's released post-Gen Con) or other SF Miniature games or role-playing games. I can't recall if I ever got around to commenting on you blog, but I've been following the Modern/near-future project that you've been working on and it looks AWESOME! Inspiring stuff!